This is easily one of the best pictures ever captured of Mimas, revealing intricate surface features and shadows cast across its iconic impact crater. The Cassini spacecraft captured this image on October 22, 2016 at a distance of 115,000 miles (185,000 km). Each pixel represents 3,300 feet, or one full kilometer. Mimas is just barely 400 km (248 miles) across, and it’s notable in that it’s the smallest body in the solar system to have a rounded shape, the result of its own gravity. Smaller satellites in the solar system, like Hyperion and Phoebe, are irregular, potato-shaped objects. Mimas is also notable for that rather large impact crater. Named in honor of the moon’s discoverer, William Herschel, the hole measures 130 km (81 miles) across, spanning nearly a third of Mimas’ own diameter. Its walls measure 5 km (3 miles) high at some points, and its elevation dips as low as 10 km (6 miles). Herschel’s peak stands nearly as tall as Mount Everest on Earth. The impact that punched out the crater nearly shattered Mimas, producing fractures on the moon’s opposite side. 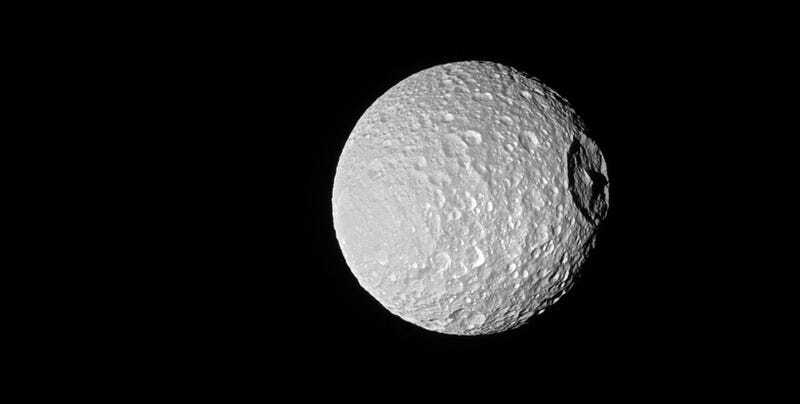 As many Star Wars fans have noted, Herschel crater makes Mimas look a bit like the Death Star. In terms of comparison, the original Death Star from A New Hope is projected to be 120 km (75 miles) wide, which is a third the size of Mimas and about 1/25th the size of Earth’s moon. Put another way, the fictional space station is nearly the same size as Herschel crater.